First Line: "I've got an idea, Lizzie... why don't you just do, like, brain surgery or something on me." Literacy specialist Lizzie Turner's days don't always run smoothly, especially when she has a reader as reluctant as teenager Andrea Mason. But Lizzie doesn't know the meaning of the word quit, and she's inspired to invite Andrea to the very first meeting of the Ashton Corners Mystery Readers and Cheese Straws Society. What no one bargains for is the fact that the man who barges in on the meeting is found shortly afterwards shot dead in his car at the end of the driveway. The man was murdered with an antique gun stolen from member Molly Mathews' house, and when Officer Amber Craig focuses her attention on the members of the book club, Lizzie knows that she's going to have to find some sort of information that will make the human pit bull stop wasting time and chase after the real killer. Author Erika Chase has the perfect premise for a cozy: a mystery readers book club set in small town Alabama whose main member is a literacy specialist who works with school boards, students, and teachers as well as teaching evening literacy classes. It's fun watching Lizzie trying to find that one spark of inspiration that will encourage someone to read, to keep on reading, and eventually to read for the sheer pleasure of it. The fellow book club members are a varied lot: a retired police chief, a wealthy elderly widow, a school teacher, an unwed mother, a lawyer, and a high school student. Their varied ages, backgrounds, personalities and areas of expertise should prove to be fertile soil for future books in this new series. 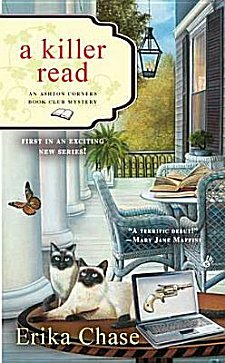 When you add romantic interest for Lizzie in the form of an old high school crush and her two Siamese cats named Edam and Brie, about the only other thing you could possibly need are lists of each book club member's reading recommendations-- mystery after mystery for crime fiction lovers of all types. I found A Killer Read to be enjoyable from beginning to end in regards to both characterization and setting. Since it is set in Alabama, I was wondering how the author would handle regional speech, and I was pleased to see that Chase adds just enough to provide true Southern flavor without going over the top. Only the pickiest of readers should object to the number of times words like "y'all" appear in the book. I did find one or two things that bothered me a bit. Each chapter begins with a quote from a mystery novel. Enough of these quotes are from books whose authors have also written blurbs for A Killer Read that it all seemed a bit like mutual admiration society overkill. Also, I've (unfortunately) gotten rather used to a bit of shoddy proofreading in the books I read, but this book has an error that shines like the brightest of beacons. The author obviously meant to refer to a Jack Russell terrier, but the dog remained a Jack Daniels terrier all the way through the editing process. I did check to see if there was a new breed of dog I wasn't aware of, but alas, no. I also felt that the book's pacing was too slow, and I think the reason why it did seem to grind to a halt from time to time was because the author gives so much detail of Lizzie Turner's life and work. It wasn't long before I knew which nights she taught literacy classes, which night was choir practice, what days she tutored students, and so forth. I really feel as though I know Lizzie quite well-- and like her-- but all the repetitive information did slow the mystery down. Yes, these things did bother me a bit, but I still found A Killer Read to be fun from beginning to end. Now that I know Lizzie and her friends so well, I'm very much looking forward to the next book in the series. I want to belong to Readers and Cheese Straw Society! I like the Alabama setting too so I'll have to check this book out. You know, after all those trips to the South (once being there for six weeks), my taste buds have never once been graced with cheese straws-- but I've certainly heard a lot about them! I can't believe you haven't eaten cheese straws. Truthfully I didn't even know they were regional! I guess my Virginia and Louisiana roots are showing. With the way I love cheese (and my southern roots), I find it rather incredible myself, Teresa! I love the name of the book club! Wish I had thought of it. Cathy - OK, my radar turned on as soon as you mention the literacy angle. How cool! But honestly, I'm a purist about editing too. I mean, no-one's perfect (goodness knows I'm not!) but Jack Daniels? Still, it sounds like a solid read. Thanks. Sounds interesting but the slow pacing concerns me some--heck, I can live with the Jack Daniels dog--if there isn't such a breed, there should be! More of those southern roots, I guess! I love the concept of the book and will put it on my list or hope someone passes it along to me. You should, Shelleyrae-- it is a very good book despite a small glitch here and there. I can't wait for the next in the series! Looks like a fun series! Barring the Jack Daniels dog error, of course -- or maybe that was supposed to be a joke? Anyway, I'll have to keep my eye open for this one. I don't know if it was meant as a joke. I kept rereading the passage to see if there was humor in it that I missed. Be that as it may, it's a fun book, and I hope you enjoy it!